I have never stayed in a hut, have you? Do they have modern plumbing … like bathrooms? Melt about half of the bag of PB chips in the microwave. Mine was very thick and I added some paramount crystals (you could also use vegetable oil or shortening). 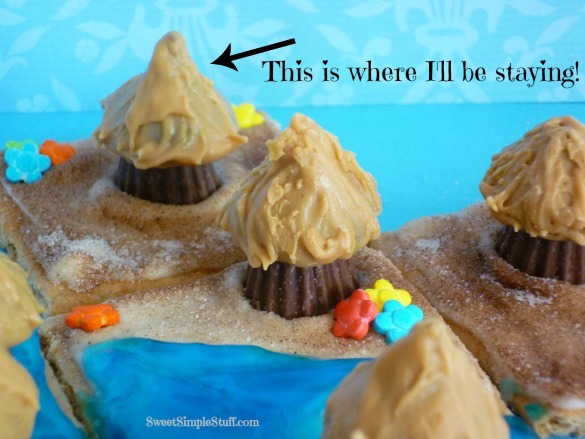 Place a dot of melted PB chips on one Mini PB cup (small side up). Place a Kiss on top of Mini PB cup, let it sit a moment to harden up. 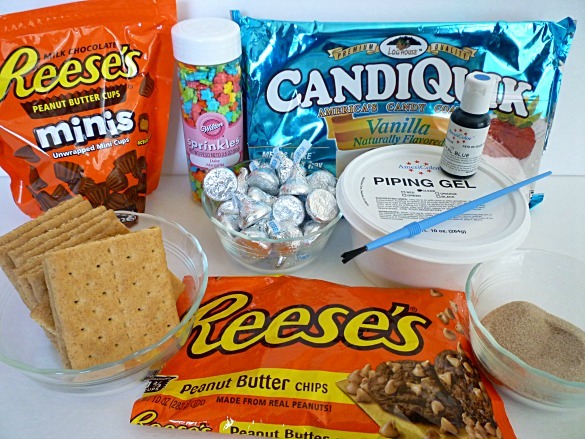 Use the paint brush to cover the Kiss with the melted PB chips and chill or let harden. I like the brush strokes, it creates texture! 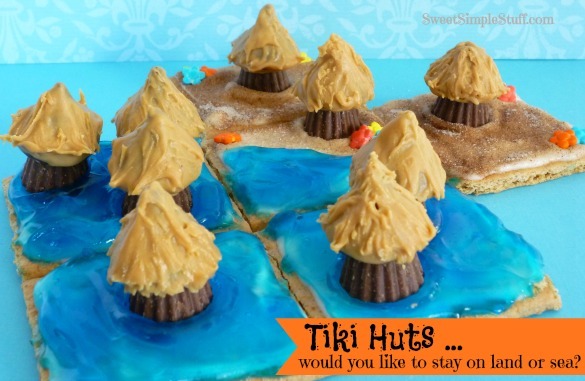 Smear melted white candy on graham cracker, sprinkle cinnamon/sugar, add a Tiki Hut (or 2), add a few flowers, let harden! 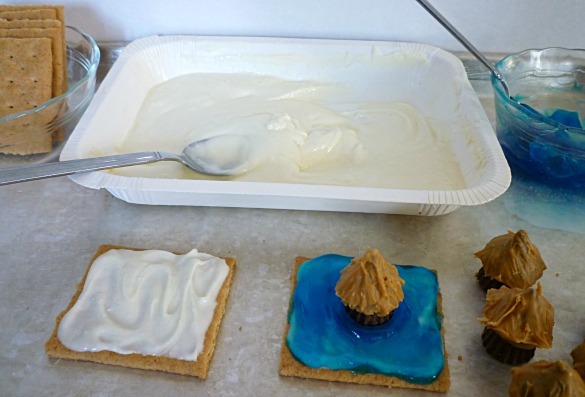 Smear melted white candy on graham cracker, chill for a few minutes, smear blue piping gel, add a Tiki Hut (or 2, or 3)! Sugar Isand just keeps getting more and more inviting. Now – chickee huts in which we can stay. YAH!!!!! We’d better book early before word gets out and the rates go up. Looking back at your photos, however, – the p.b. roofs have enough texture with just the paint brush swirls. I’m also thinking about piping the outline of a door (with the p.b. chips) on the Reese cups before the Kiss is attached. But then…the Reese cup might be too small to do that on. 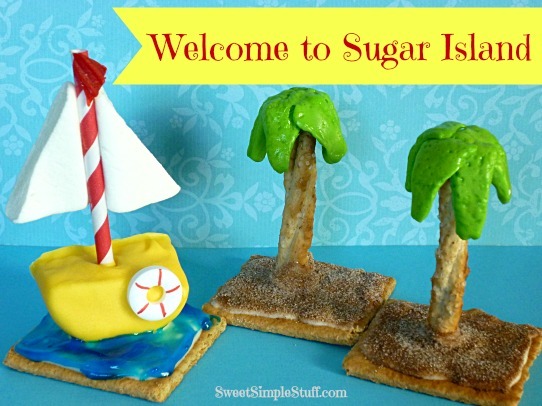 Oh well….you obviously have got me excited about Sugar Island. 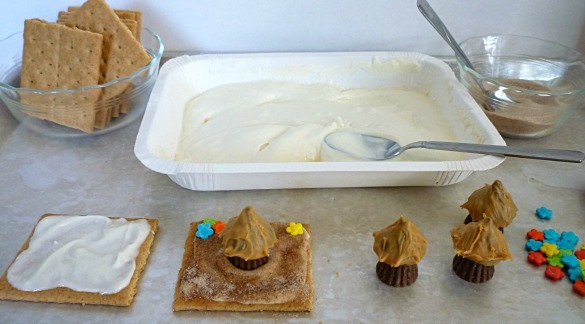 Somebody better hurry and invite me to a party so I can make these! Thanks for keeping us entertained. Hi Tavette! Let me know how the doors turn out … I tried and wasn’t happy … so I simplified … no door. I’m thinking more & more that it will be hard to draw a straight line (for door) on the corregated Reese cup, so maybe one could cut a real small rectangular piece of a graham cracker for the door, dot for the door handle and then “glue” it onto the Reese cup. I haven’t looked at the size of a mini Reese cup lately (dangerous for me to buy an entire bag) so maybe that’s out of the question also. ??? OR…..using a very sharp knife, scrape away the corregated part of the Reese cup in the shape of a door and fill in with milk chocolate. You’ve really got me thinking on this one. Any way they’re done – they’re just too cute. Great addition to the island. So sorry it took so long for this reply … the mini cup is smaller than a Kiss. Did you make the door? I bet the Peanut Butter man liked these. They are adorable….I think I want some. if only you could blow these up so i can stay in there,. then when i want to go outside i would just eat myself outta them…never mind, i’ll just eat the whole island. You make the cutest desserts!!! Love!! I adore the little tiki huts; so cute!